Told from the perspective of multiple staffers, the Brooklyn Museum technology blog—BKM Tech—provides a window into major lessons learned across technology projects at the Museum. Posts have included details pertaining to major institutional strategy shifts, experiments, metrics, code releases, the lessons learned in deployment of initiatives from start to finish, and how we measure success. The aim has been to tell each story from a variety of view points with authors including technologists, designers, project managers, and content specialists. In one recent example, a series of posts detail the Museum’s challenges implementing ibeacon, the technology used to position visitors throughout the galleries for the ASK Brooklyn Museum app. 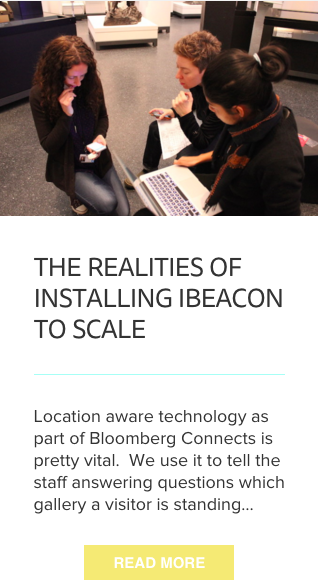 The ibeacon series includes tips like hacking a cart with a ladder, the use of a selfie stick to ease physical installation, and a code release of all app side beacon code. Another series of posts related to ASK, demonstrate how the Museum has staffed the project and explained necessary changes as the project has progressed over the past two years. Other posts detail the pedagogy of text messaging and have released the engagement manual the staff uses to engage with visitors through text messaging. The blog is not limited to information sharing about ASK Brooklyn Museum. Other posts have described changes to social media strategy, forays into 3D printing, working with Wikipedia, copyright policy, and changes to the collection online. Over the many years of its existence, the BKM Tech blog has been written to share as much information with the sector as possible and with the greatest transparency.